This Dec. 18, 2015, view of the downwind face of "Namib Dune" on Mars covers 360 degrees, including a portion of Mount Sharp on the horizon. 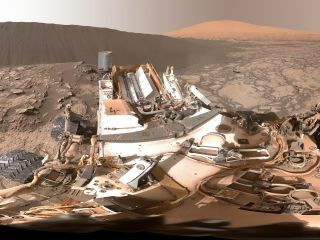 NASA's Mars rover Curiosity has captured some spectacular new photos of big, active sand dunes on the Red Planet. The new images depict the dark Bagnold Dunes, which Curiosity has been studying for about 6 weeks in history's first up-close investigation of extraterrestrial sand dunes. "The mission's dune-investigation campaign is designed to increase understanding about how wind moves and sorts grains of sand, in an environment with less gravity and much less atmosphere than well-studied dune fields on Earth," NASA officials wrote Monday (Jan. 4) in a description of the new photos, which Curiosity took between Dec. 17 and Dec. 21. This view from NASA's Curiosity Mars Rover shows the downwind side of a dune about 13 feet high within the Bagnold Dunes field on Mars. "The Bagnold Dunes are active. Sequential images taken from orbit over the course of multiple years show that some of these dunes are migrating by as much as a yard, or meter, per Earth year," agency officials added. The newly released photos depict the downwind side of Bagnold's Namib Dune, which rises at least 13 feet (4 meters) from the surrounding landscape, NASA officials said. The Bagnold field lies on the northwestern flank of the 3-mile-high (5 kilometers) Mount Sharp, whose upper reaches are visible in the distance in one of the photos. The car-size Curiosity rover touched down inside Mars' 96-mile-wide (154 km) Gale Crater in August 2012, on a mission to determine if the Red Planet could ever have supported microbial life. The robot quickly found evidence of an ancient lake-and-stream system near its landing site, and Curiosity's subsequent observations have provided further information about this long-ago potentially habitable environment. This Dec. 17, 2015, view combines multiple images from the telephoto-lens camera of the Mast Camera (Mastcam) on NASA's Curiosity Mars rover to reveal fine details of the downwind face of "Namib Dune." Curiosity reached Mount Sharp's base in September 2014, completing a roughly 5-mile (8 km) trek across Gale Crater's interior. Curiosity experienced a problem with its 7-foot-long (2.1 m) robotic arm last month that affected the rover's operations for a few days. But mission team members quickly addressed the issue, which was identified as a minor software glitch, and the arm was back to normal by Dec. 23, NASA officials said.